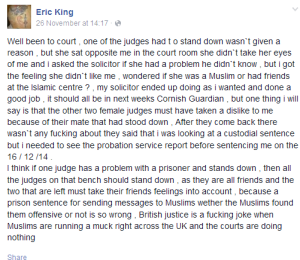 Eric King’s suspended prison sentence creates a new set of questions about offline and online anti-Muslim bigotry. 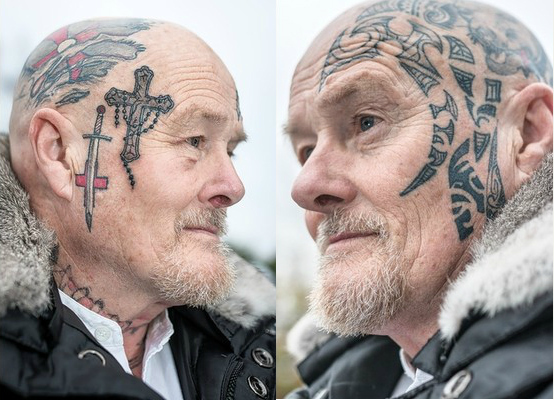 King, 60, pleaded guilty in late November to sending a grossly offensive image to Tipu Choudary, general secretary of Cornwall’s Islamic Cultural Centre, and sending two grossly offensive messages to the centre’s Facebook page. Angry at the terrorism of ISIS, King printed two images from his mobile phone that depicted the prophet Mohammed engaged in sexual activity with a pig and a naked woman squatting over ISIS’ appropriated flag. Before posting the images to the Islamic Cultural Centre, King smeared both images with his dog’s faeces. The Islamic Centre became a source of anger for King after its conversion from a Methodist chapel in 2009, a move he saw as “sacrilege against our God”. 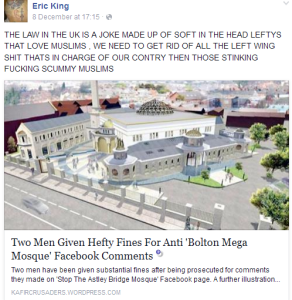 King used his Facebook account to tell members of the Islamic Centre that their faith was “evil” and they must “get out of the country”. Paul Gallagher, who acted as King’s solicitor, stated that Facebook gave his client a “voice” and he now intended to limit his opinions to his own account. Gallagher also revealed that his client had previous convictions for harassment and assaulting a police officer. Magistrates adjourned the case until December 16 pending a full probation report. Nor had King apologised or expressed remorse for his actions. 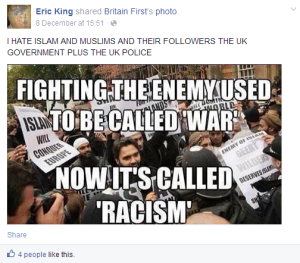 At the trial’s conclusion, we learnt from the prosecution that King was a self-proclaimed member of the British National Party (BNP) and supporter of the English Defence League (EDL). King received an eight-week prison sentence suspended for a year, a 20-week curfew that lasts from 10am-10pm for most of the week (except Sunday when King is allowed to attend church), and pay £200 compensation to Tipu Choudary. Unapologetic and unremorseful, King apparently refused to the pay the victim surcharge as his letter was directed at the Islamic Cultural Centre, not Choudary. Nor would the court experience deter King from his bigotry. According to the prosecution, King told the court ‘I was hoping that whoever saw the letter would kill themselves’. So why did King avoid prison? One mitigating factor might be his poor health (chronic joint pains and heart condition). 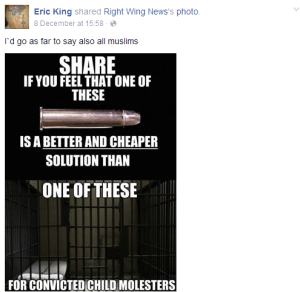 King is entitled to his free speech but the contents of his personal Facebook go beyond valid religious critique to outright hatred of all Muslims. 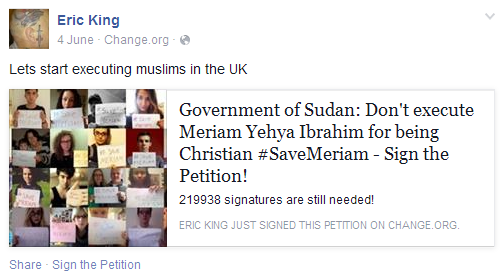 On December 17, he posted a link to an e-petition requesting a public vote on banning Islam in Britain. King rallied against ‘hard and soft lefties that love stinking f*cking scummy Muslims’ on December 8. 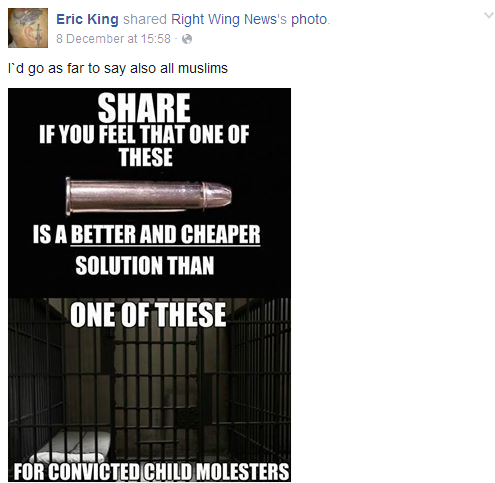 On the same day, King shared a right-wing meme about shooting paedophiles, King added his own thoughts: “I`d go as far to say also all muslims”. This extreme rhetoric goes far beyond the pale of acceptability. King ramped up the conspiracy rhetoric by posting: “Any body with British ancestory need to be on their guard all Muslims are sleepers” on November 28. 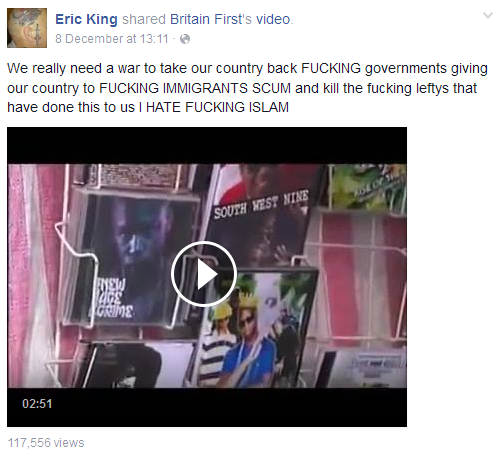 The tone and rhetoric often mirrors the likes of Britain First on Facebook. During the trial, he speculated that one of the judge’s (who stood down) disliked him because ‘she was a Muslim or had friends at the Islamic centre’. 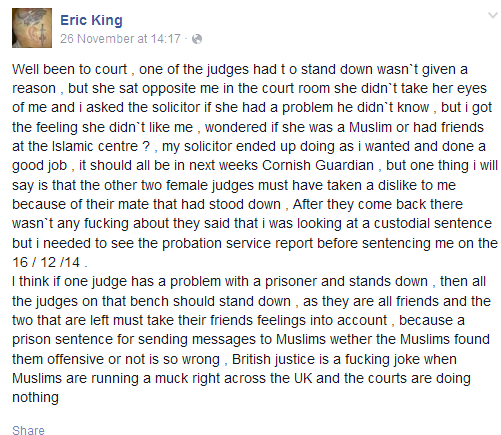 That rant ended with the popular far-right conspiracy about a two-tier justice system favouring Muslims. 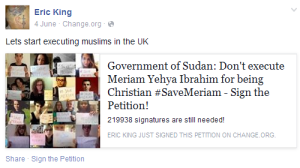 On June 4, King posted: “Lets start executing muslims in the UK” after posting a petition to save Meriam Yehya Ibrahim. 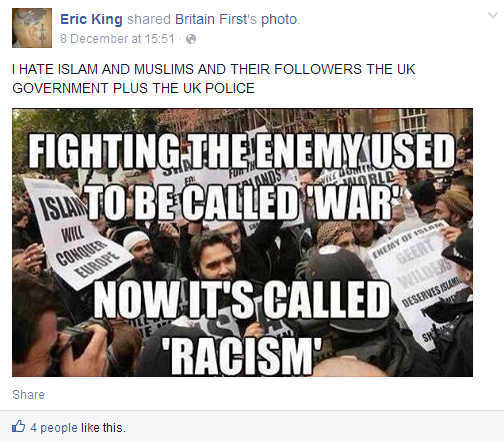 King is using his gained freedom to connect with other far-right individuals including Britain First’s deputy leader Jayda Fransen, and the dubious onlinecollective Sikhs Against Sharia.